It's blog hopping time! We are so happy to be joining together to bring you this Bloglovin Blog Hop to help grow our blogs. The recent news of saying goodbye to the Google Reader leaves us all wondering, will Google Friend Connect be next? It's always a great idea to have many ways for friends to follow to your blog. 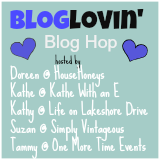 We are so excited to host our first Bloglovin Hop! Each week we will rotate one other social media outlet to follow. This week we are featuring Google+ along with Bloglovin! Please follow each hostess and leave us a comment so we can return the follow! if you would like to be a co-host. Please link up your Bloglovin follow link. just click on your Follow By Bloglovin button. We hope you make many new friends and followers each week. Hello there! Thanks for the invitation: have accepted, and followed the other hostesses. Thanks to you all for hosting, by the way. Am in the process of transferring over to Blog Loving, having learned about the proposed closure of GFC etc. Having trouble getting the button onto my blog, but will get there eventally. Done the Google + bit as well. New bloglovin follower, thanks for hosting! I have transferred to Bloglovin'. I was a Google Reader Fan and I think change is hard. Hi Kathe, thanks for hosting, I'm following along on BlogLovin. Hi Kathe! What a great idea. I'm now following you on Bloglovin'. Hi, following you on bloglovin! Thanks for the party! Have an great Friday my Friend!! Thanks for hosting this linking party, Kathy...have a great weekend!